I have never been a big fan of Baden’s carnival, probably since I live in its center and can’t escape it, but I really enjoyed Fasnacht in Basel. For one thing, it had more creative costumes and masks. For another, it actually seemed like the “musicians” rehearsed ahead of time. A Basel local confirmed this. The bands are allowed to practice up to three weeks beforehand in designated areas of the city. There are two kinds of music at Fasnacht in Basel: traditional and Guggen. I preferred the traditional music myself, which consisted of fife and drum bands in groups from 2-25 who wandered the streets with no shame in running you over should you somehow fail to see or hear them coming. Guggenmusik is normally too loud and obnoxious for my tastes, as it consists of mainly brass instruments played by large bands from a stage, which during Carnival in Baden, is typically right below my window. The other thing I loved, besides the lantern display in front of the cathedral that was one part art show-one part political statement, was that the entire city of Basel was carpeted in confetti. 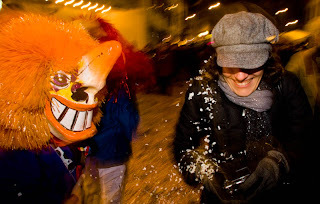 I got doused with my own good dose, as it is tradition that unless you buy a Basel Fasnacht pin and display it proudly (the Swiss love festival pins—don’t get me started on them), you are fare game to get covered in confetti. 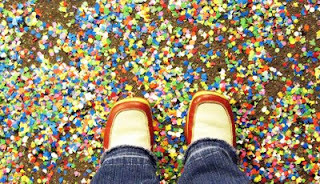 But the real novelty of the confetti carpet is that it’s so un-Swiss. Normally, even stray leaves are swept up the moment they dare decide to cross with a sidewalk, so the fact that so much colorful confetti was allowed to be thrown about the city not to mention allowed to stay around for more than five minutes before a street sweeper appeared was really something else. I loved it and took many photos of my feet, amazed that they could be standing among such creative clutter and still be in Switzerland. Sadly, I’m sure by today there’s not a trace of confetti to be found. I’m sure that the street sweepers have done their religious duty. And I’m sure that overnight, Basel has become yet again a city of serious people wearing black coats and walking on perfectly clean sidewalks under a coordinating grey sky. But at least now I know where to go once a year in Switzerland to find its real spirit—even if the people have to put on masks to be brave enough to reveal it. I'd love to see the Morgenstreich parade--if I can ever get myself up that early. Especially if there's no possibility of being doused with confetti! confetti? who says the swiss never their their hair down! it must have been fun to be in the thick of things! Yes, it's especially exciting to be confettied when you know it's probably by someone that usually walks around in a black suit and doesn't smile. ooooh, I have to check this out. I don't think I've ever seen confetti being thrown outside here, only inside and kids parties etc. obtain limitless coins and gold in wikidot.com/ any type of type of android Know More video game you desire Nonetheless, video Download Game Killer APK for Android, iPhone/iPad & PC game killer has actually limited feature on Game Killer Download online android games Game Killer Apk is an Game Killer efficient android application. It just doesn't have the proper suspension or zohosites.com/ sling seat making it cushy for children, neither is it simple to press Website and also guide when you're perspiring. As well as for day-to-day use, this fool is heftier than the majority of.Top Rated Convertible Car Seats 2017 Reviewed The FLEX baby stroller has all the capability of the SE version. Hey There. I discovered your weblog the use of msn. That is a very neatly written article. I’ll make sure to bookmark it and come back to read extra of your helpful info. Thank you for the post. I’ll certainly return. Visit our site and download the latest apk available and also know the guidlines for installing these apks. This is very interesting information. I learn some idea in this article. I appreciate your collection. Nice post thank you for sharing, This is very interesting, You are a very skilled blogger. 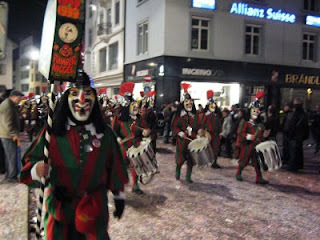 Maybe I am a fan of Baden’s carnival and I am also enjoyed Fasnacht in Basel. Wow your content is too good and it keeps is more information please share more content like that. A motivating discussion is worth comment. I do believe that you should publish more on this subject matter, it might not be a taboo matter but usually people don't talk about such issues. To the next! Many thanks!! Hello there! I could have sworn I’ve visited this blog before but after looking at some of the posts I realized it’s new to me. Nonetheless, I’m certainly delighted I came across it and I’ll be bookmarking it and checking back frequently! You need to be a part of a contest for one of the most useful blogs online. I'm going to highly recommend this website! I absolutely love your site.. Very nice colors & theme. You certainly put a new spin on a topic that's been discussed for decades. Great stuff, just great! I appreciate you for genuinely so kind and then for deciding on this kind of magnificent ideas most people are really needing to be aware of. Greate Post, I want to same like this at next time. Any one can visite the Amarpriyo.com . I don't know what need to modified for the website. It is a Best online shop in Bangladesh which offers all kind of products to the consumers. Example: Original cosmetics products, Clothing, footwear, mobiles and tablets, computer accessories, gadgets, bags & backpacks, home & living, health and beauty and many more.